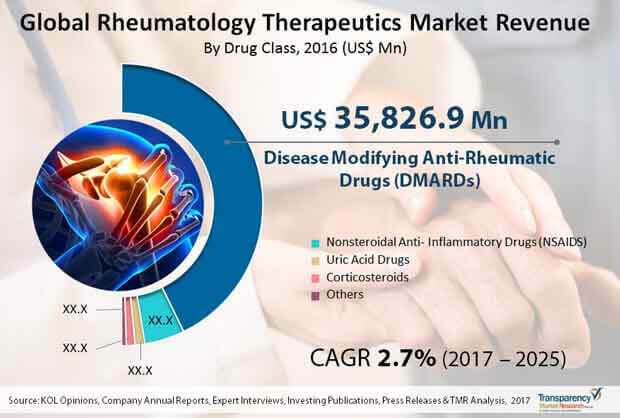 A rising elderly population and increasing allocations for research and development of new drugs is what is serving to drive growth in the global rheumatology therapeutics market. This has led to the emergence of many new drugs. Their swift approvals by the appropriate authorities has also led to the growth in the market. A report by Transparency Market Research uncovers after in-depth study that the global rheumatology therapeutics market will rise at a lackluster CAGR of 2.7% from 2017 to 2025 to become worth US$ 52.96 bn by 2025 from US$41.88 bn in 2016. Depending upon the drug class, the key segments of the global rheumatology disorder market are disease modifying anti-rheumatic drugs (DMARDs), non-steroidal anti-inflammatory drugs (NSAID’s), corticosteroids, uric acid drugs, etc. The DMARDs, which is a group of medicines or combination of medicines used to treat rheumatic diseases by blocking the inflammation, accounts for maximum shaee in the market at present. They are categorized into two major types - biologic DMARDs and synthetic DMARDs. The biologic DMARDs are mostly used for the treatment of various rheumatic diseases such as rheumatoid arthritis, psoriatic arthritis, and ankylosing spondylitis. The patent expiry of top brands such as Humira, however, is expected to deal a blow to the growth in the segment. Market pundits predict the challenge will eventually be overcome by the wide pipeline of other biologics such as interleukin-6. By rising at a 2.6% CAGR from 2017 to 2025, the segment is projected to pull in a revenue of US$45.06 bn by 2025 from US$35.83 bn in 2016. Azathioprine, cyclophosphamide, cyclosporine, and methotrexate are highly used synthetic DMARDs for the treatment of rheumatic diseases. In terms of growth rate, corticosteroids are anticipated to surpass all other segments by clocking a CAGR of 4.4% from 2017 to 2025. Rising at this rate, the segment is projected to pull in a revenue of US$1.22 bn by 2025. Their increasing use in developing countries will likely boost their demand. From a geographical standpoint, North America accounts for a leading share in the global rheumatology therapeutics market because of a rapid rise in the elderly population, who are afflicted with different types of rheumatology disorders. In addition to that, adoption of biologics and biosimilars products for the treatment of moderate to severe rheumatoid arthritis and well-established healthcare facilities has also provided a major boost to the market in the region. Europe trails North America vis-à-vis market size. In terms of growth rate, however, Asia Pacific is predicted to lead. This is because of the significant proportion of population suffering from rheumatoid arthritis and osteoarthritis, increasing per capita healthcare expenditure and approvals of biosimilars for the treatment of several types of rheumatology disorders. Prominent companies operating in the global rheumatology therapeutics market are AbbVie, Inc., Pfizer, Inc., Bristol-Myers Squibb Company, Merck & Co., Inc. etc. accounted for the major share in global rheumatology therapeutics market in 2016. The other global players operating in the market include Amgen, Inc., Janssen Biotech, Inc., Novartis AG, Genentech, Inc., Sanofi, and Takeda Pharmaceutical.